MP3 Rocket bills itself as the fastest YouTube to MP3 converter - and it does, for sure, freely convert videos, even download YouTube videos, to MP3 format, drastically changing the music download arena, especially since the old favorites like LimeWire disappears on the scene. 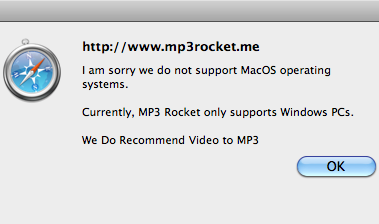 What's a pity is this tool doesn't work on Mac OS X, which has been explicated on its official website. Accordingly, many people get a message saying that the download is corrupt like the case mentioned above in case of downloading the software. In the case, all you need is a MP3 Rocket for Mac alternative that makes YouTube to MP3 downloading and conversion a simple piece of a cake. Thankfully, MacX Video Converter Pro is the reliable YouTube to MP3 downloader that you can make use of at ease. It is awash with awesome YouTube downloader and excellent video converter for Mac, providing quite capable at downloading and converting YouTube video to MP3 as well as other audio/video formats such as AAC, iPhone Ringtone, AC3, WMA, WAV, etc. 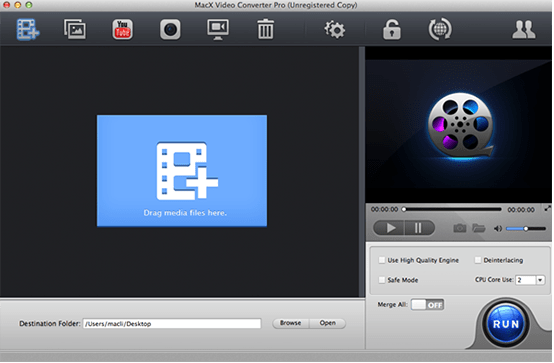 Besides the unmatchable YouTube to MP3 audio converter feature, the video converter for Mac superior to MP3 Rocket lies in its outstanding video converting ability, able to convert among videos in both HD and SD formats without compromising quality, like MKV to MP4, WMV to MOV, MP4 to AVI, AVCHD to MOV, etc. Therefore, Mac users cannot only sync YouTube videos to MP3 compatible iTunes but also play other video files on iPhone, iPad, Android, etc with ease. This program boasts an neat and user-friendly interface that makes YouTube to MP3 conversion as easy as ABC. Now follow the steps below to download MP3 Rocket for Mac and convert YouTube video to MP3 format for playback on media player you like. Install and launch the software. Click "YouTube" button, copy and paste the YouTube video URL to the type box. After you click "Auto add to convert list", press "Download Now" to start capturing and downloading YouTube video. Once the downloaded video appears in the pop-up window, choose MP3 format from "to Music" from the drop-down list. Hit the "RUN" button and start YouTube to MP3 download. All the tasks can be finished at fast speed and high output quality. Not only does the MP3 video converter for Mac works fine in downloading and converting YouTube video to MP4, MP3, MOV, AVI, WMV, and other audio/video formats, but also it possesses excellent device profiles that MP3 Rocket doesn't have. The infused 376 device profiles enable you to convert video to Samsung Galaxy Tab S, Galaxy S5/4/3, iPhone 5S/5C, iPad Mini with Retina, HTC One M8, Amazon Kindle Phone/Fire, PS4, Surface Pro 3, etc. 1. MP3 Rocket only saves audio in 256kb/s bit rate, which means the download and convert speed is invariable. For a faster one, you need an equivalent. 2. Songs sometimes won't play sound. 3. It freezes with black screen.